Welcome back to our blog series on renter turnover! This can be an unfortunate downside of owning a rental property, but our non-recourse loan lenders have tips to make it easier. Learn more in our blog, and apply for a non-recourse loan with First Western Federal Savings Bank to turn your investment goals into a reality. Whether looking to refinance your current IRA loan, wanting to invest in a vacation rental property or a long-term tenant rental, we can help. In the meantime, here are some ways to deal with renter turnover. If you have a single-family unit, such as a modest house, that’s not directly in a city, you’re likely to attract people or families who are going to stay put for at least a few years. If you own a house with multiple rooms for rent in a college town, you’re going to experience a ton of turnover. In a place with lots of turnover, you’ll need to adjust your strategy for finding new tenants. We’ll dive into some specifics in a moment, but know your rental audience, and be prepared for turnover depending on the type of property you own and where it’s located. Incentivize people to stay (or to sign on early). Make it appealing for people to stay at your place, and you might be able to keep the same tenants longer instead of feeling forced to operate the revolving door of new renters. Consider knocking even $5-$20 off of rent per month, or provide a $100 reward for signing on again. It might seem like a lot of money, but it could well be worth the time that you won’t have to spend looking for new tenants. Plus, spending $100 on your loyal tenants that you love and want to keep is highly preferable to losing a month’s worth of cash flow because you couldn’t find someone to move in soon enough. Additionally, if you do have a high turnover property, consider making it enticing for people to sign on early, so that you have tenants leave and new ones move in with barely any vacancy in between. You could set up a deal with the local gym for a discounted rate for tenants, cut rent in half for the first month, or find another incentive that might encourage people to sign on right away. 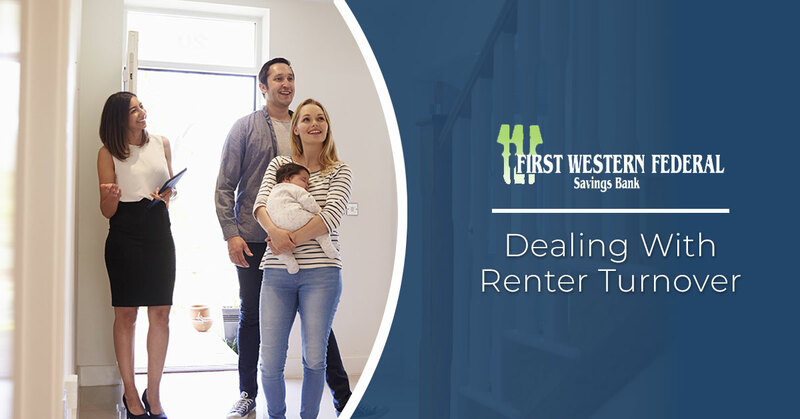 Give yourself plenty of time to find new renters. Oftentimes, rental property owners set it up so that tenants need to give 30 days notice before they plan on moving out. This might be enough time for you as a property owner, but you can absolutely put expectations in place that your renters need to give you 60 days notice, or another amount of time that works for you. If you do this, send out reminders to your tenants well before their lease is up and the notice would be required, so that they have time to plan and there won’t be any surprises. We’ll cover a few more ways to prevent high turnover for your renters in a future blog. If you can avoid having to deal with high turnover, you’ll get to experience the many benefits of having a rental property — and accessing these benefits all starts with a non-recourse loan. Apply with our lenders at First Western Federal Savings Bank to get started!